Santos is one of the most recognisable names in fruit juicing, and this high output juice extractor will keep delivering exceptional juice from a range of fruit and vegetables. It's a commercial grade, heavy duty 3000 rpm machine which can produce 1litre of juice in 60 seconds making it a great choice for a busy business or customer facing setting. 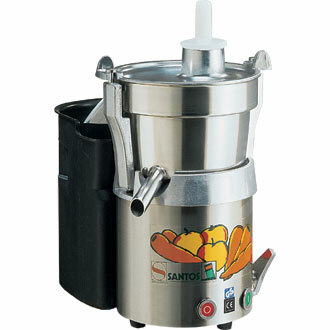 This commercial Santos high output juicer is available from Nisbets online with next day delivery. Dear Sir, I own a healthy restaurant and you like to purchase a good juice extractor for my restaurant. Can you please let me know how I go about and can you deliver to the Aruba the Caribbean.